﻿ BENZ RAMBOUILLETS - Rambouillet Sheep that perform and produce! American Rambouillet Sheep Breeders Assoc. North Dakota Lamb & Wool Producers Assoc. Our goal is to raise big framed, correct, fast growing Rambouillet sheep with a good fleece. We hope they work in the show ring but our goal is to raise the kind of sheep that can live on grass and survive in nature's conditions. Our 60 ewes are all DNA tested and are expected to lamb by themselves and get their lambs up and nursing without assistance. The ewes pasture and are expected to breed on native North Dakota grass. We think Rambouillet sheep can be "pretty" as well as tough. We have a high percentage of scrapie resistance in our flock and normally have a number of RR rams and ewes for sale. If you have any questions about our operation or the sheep pictured below please contact us. Benz Rambouillet is now in the fifth generation raising sheep in the United States. Mathias and Rosina Benz immigrated to the United States from Russia in 1893. 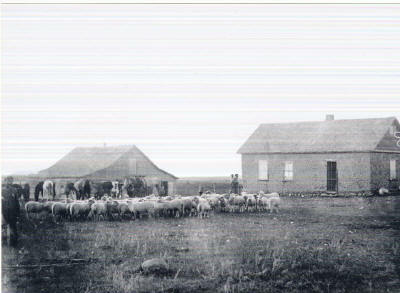 It is unknown if they raised sheep in the old country, but they immediately started raising sheep upon arrival in the Dakota’s. At one time several thousand head of sheep were raised by Benz’s in Mercer County, North Dakota along the breaks of the Missouri River. It is thought these sheep were a mix of Merino, Lincoln, and various black face breeds. In the 50’s the commercial flock of Friedebert and Emma Benz was primarily Rambouillet and Columbia. Darold and Della Benz added a flock of registered Suffolks in 1968 and Rambouillet in 1972. The commercial ewes were sold in 1983 and the Suffolks were sold in 1986. In 1987 the ewe flock was split between Darold and Della and Matt and Amy. These flocks have been run separately since that time. Justin has a group of ewes that are running with the main flock until he gets his own place. In the spring of 2014 the operation was relocated to St. Marys, KS. The first registered Rambouillet ewes were purchased from Lenard Chapman and George Erk. Since then there have been a handful of ewes added to the flock from breeders throughout the United States, but most of the ewes in the current flock trace directly to the original Chapman and Erk ewes. Outside rams have been introduced from several breeders since then. Since 1972 the primary emphasis has been to raise sound-footed, heavy muscled, good fleeced sheep on a large frame. Our ewes run on native pasture and are wintered with minimal shelter except during lambing. We expect them to thrive in tough conditions. We have off the farm jobs and the ewes often go without being checked for up to 14 hours during lambing. The ewes are expected to lamb and mother up on their own. If they fail, they get sold to slaughter. The lambs and ewes are fed whole grains and grass and alfalfa hay when conditions dictate. Currently we lamb a group of ewes in January and in September. In addition to private sales we sell rams and ewes at the National Show and Sale, Hettinger Ram Sale, Newell Ram Sale and the Midwest Ram Sale. Matt retired from being an operator at Dakota Gasification Company in 2012. They make natural gas and anhydrous ammonia from lignite coal. Matt is a past president of the American Rambouillet Sheep Breeders Association and is a former director of the North Dakota Lamb and Wool Producers among other activities. Amy is a retired middle school English, science, and technology teacher. She has a master’s degree in Elementary Education and is a National Board certified teacher. She is also involved in state and local education committees and boards. Matt and Amy graduated from NDSU where they both judged on the livestock judging team, Matt also was on the wool, and dairy judging teams, and Amy was on the meats team. We enjoy coaching 4-H and FFA livestock judging teams and have had eight teams win the state contest and go onto national competition. Justin graduated from NDSU with a degree in Animal Science and Kansas State University with a MS in animal science with emphasis on swine nutrition. He was on the meats and livestock judging teams at NDSU. Currently he is working in the Beulah area and is involved in the day to day operations of the Rambouillet flock. Cassie married Spencer Jones in 2007. They both received their undergrad and MS degrees from Kansas State University. Cassie earned a Ph.D. from Iowa State and is currently a professor in the feed science department at Kansas State University. Spencer is a nutritionist at Wildcat Feeds in Topeka, Kansas. Spencer, Cassie, their son Ty, and daughters Hadley and Hayden also have a registered Angus herd at their home in Belvue, KS. A special thanks to Kade and Wesley Hodges of Sterling City, TX for their support in 2012. The purchased virtually all of the sheep we consigned to public auction. It certainly is an honor to have such a historic Rambouillet flock place their faith in our breeding program as they plan to re-establish their prominence in the Rambouillet breed. Also thanks to Radde Ranch from Sterling City, TX for the support over the past years. Delmar will be missed following his passing in March 2013. More thanks go out to the Kott family of Junction, TX for the excellent job you have done preparing and showing sheep that were purchased from us. *Many time Champion ram at the Texas major shows. Perhaps the most successful show ram in Texas history. STUD RAMS ARE CURRENTLY WORKING IN THESE FLOCKS! Site design copyright © Countrylovin, Ltd. Please contact web@benzrambouillet.com for web related issues.